New Materials “2N7″,”2N8″,”2N9” | TOMITA ELECTRIC CO., LTD.
We are releasing the three new materials 2N7, 2N8 and 2N9 in response to more market demands of higher temperature and requirements in each temperature range which aim downsizing and lower power loss. 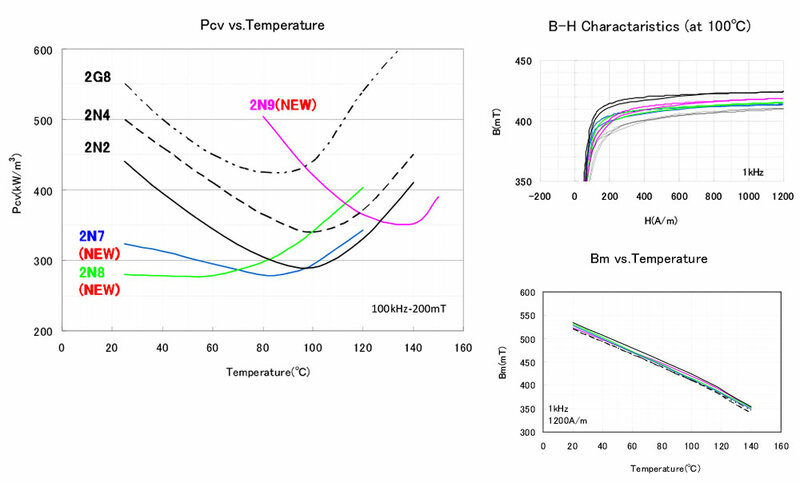 These 3 new materials can be performed in each temperature range from room temperature to 150 degree C.
We supply materials performing low loss in wide range of temperature and high saturation magnetic flux density, along with our 2N2 material. Therefore, the customer can select materials conforming to the requirements in temperature range. It’s superior in versatility and suitable for various types of power supply devises, power transformers and choke coils for EV/HV and DC/DC converters.